I happened to be in Shibuya for the "anti-Nikezation" march on Sunday. You can read the details at Global Voices Online, but the short version is: Nike are buying naming and renovating rights to Miyashita Park for five years, and the locals aren't happy about the idea of an EXTREEEEEME SK8 PRK replacing the current setup whereby locals and the blue-tarp community share the park peacefully and non-radically. Well, they're getting radical now. Doku is a Japanese verb meaning "step off," "get out of the way", and doite here is the imperative form. A truly local response. In a few decades' time, when the corporatist dystopia has advanced to a level that makes park sponsorship look like the Paris Commune by comparison, I will look back on this pun and smile to the maximum extent my compulsory implants allow. Asahi.com is reporting that Japanese academic ORII Yoshimi 折井善果 has located a copy of Fides no Quio ひですの経, a rare Nagasaki Jesuit text from 1911 1611, among the books of E. G. Stillman held by Harvard. Meanwhile, other news stories give the title of what this is really a translation of as "信仰綱要序説" ("Introduction to the Essentials of Faith"), so I really have no idea what's going on here. Any Jesuits reading this, please draw on your strategic reserves of caritas and help me out. Also of note: the cover page gives the date as "御出世以来千六百十一年" -- "One thousand six hundred and eleven years since his [+honorific] entry into the world." Buddhists used 出世 to refer to the entrances of their revered figures, too; I wonder if the Jesuits borrowed it from them. Just noticed online: the full text (I think) of MORI Ōgai 森鴎外's 1889 collection of translated poetry, Omokage (於母影, "Images"), "considered the first poetic anthology in Japanese to successfully convey a sense of the aesthetic qualities of Western poetry." Also no doubt relevant is omokage's status as a key word in Japanese poetics, meaning roughly "the visions/emotions/ideas evoked by a work." Note that (a) Ōgai has given his translation an ABAB rhyme scheme, and (b) the 4/3 catalectic trochaic meter of the original neatly matches the comfortably Japanese 7/5 of the translation. Why? Because he didn't want anyone to overlook the fact that his translation into Chinese precisely preserves syllable count, rhyme scheme, and even stress pattern, via transmutation of the latter into a ping/ze 平仄 tonal scheme instead. As YOSHIKAWA Kōjirō 吉川幸次郎 says in Kanbun no hanashi 漢文の話 ("Rappin' about kanbun"), this is yet another illustration of just how serious the Japanese literati used to be about Chinese. Readers who were reliant on the traditional kanbun transformation to formal Japanese (for example, turning the first line into 波上の纎月、光糾紛 Hajō no sengetsu, hikari kyūfun) would not be able to appreciate the structural features that Ōgai worked to preserve. Even readers who were comfortable reading in Chinese-grammar order would miss out on the rhyme scheme unless they knew the proper Chinese pronunciation of the words too: 紛/墳 rhymes in Japanese too, but 叢/中 isn't even close. In other words, the full effect of this translation can only be appreciated by an audience who can read Chinese as Chinese. That was Ōgai's audience. I got nothing today, so here are two real-life loldogs I observed posted on a shop window recently. The text at the bottom says "I'm hungry!" 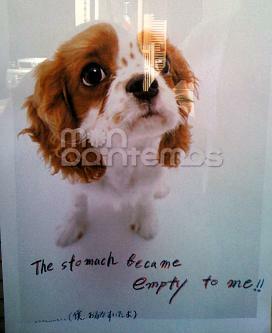 in Japanese, in the standard phrasing, which is, literally, "my stomach has become empty." Thus the awkward English. The first part of that's got to be Irasshaimase. The second half, maybe Go-raiten o o-machi shite orimasu? 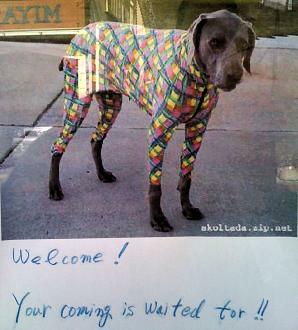 That aside, this dog is not much of a salesman. The only emotion he evokes is pity. One thing that really surprised me when I first arrived in Japan is that pet dogs set off my gaidar, just like a white person would. This doesn't happen to me any more, but I think it demonstrates the extent to which we anthropomorphize pets: not only are they people, they're people of the same tribe as us. You might expect Japan to be all politicked out after the last couple of months of campaigning, voting, and editorializing for the New York Times and Mu . But you would be wrong. Just today I noticed that a new party had leapt into the fray with the publication of its "Jacket Party Manifesto" (ジャケット党宣言) in the current issue of underground anarchist review Non-no . The Jacket Party itself seems to consist of a number of factions, including a right-wing splinter group of militaristic yet feminine biker types, but they claim broad popular support: "This autumn, everyone will [rally behind] the Jacket Party Manifesto!" Their specific campaign promises include increases in fashionability of 100% or more. But seriously, using 党 (-tō, "faction, party") to specify taste cliques ad hoc is a common technique in Japanese. Two of the oldest and best-known non-political parties here are the amatō 甘党 and karatō 辛党, the Sweets and Spicies respectively. Today these are often used to mean "People with a sweet tooth" and "People who prefer spicy food" respectively, but the original opposition was between sweets and booze. Another group that welcomes drunks is the satō 左党, "Left Party," so named because "left-handed" (hidarigiki [or, more commonly, hidarikiki]) is also slang for a hard drinker. The most commonly given etymology for this, found in sources like UMEGAKI Minoru 楳垣実's Ingo jiten 隠語辞典 ("Dictionary of cant"), makes it an Edo pun: workmen would hold their hammer in their right hand and their chisel (nomi 鑿) in their left, making the left hand the nomi hand, and equally so when the nomi in question is the other one, meaning "drinking" (飲み). This seems rather fanciful as etymologies go, but elaborate wordplay was the cornerstone of Edo culture. The more prosaic alternative explanation is that you drink with your left hand so that your right hand can more easily hold the bottle to pour from and/or grab your sword when things get drastic. It's also worth noting that most books of etiquette recommend that men hold the sake cup in their left hand even today. No doubt everyone reading this knows that Tokyo used to be called Edo. But did you know that it changed on this day in 1868, a.k.a. Meiji 1? Yes! Via an Imperial edict affectionately known as the Decree that Named Edo Tokyo (江戸ヲ称シテ東京ト為スノ詔書). I at this time settle all matters of state myself in the interest of the people. Edo is the largest city in the eastern provinces, a place in which things gather from every direction. It were well that I should personally oversee its governance. Therefore from this time on I shall call it "Tokyo" ("Eastern Capital"). This is so that I might oversee all affairs in the land equally, from east to west. Let the people heed this my will. Note the emphasis on Imperial self-determinaton, this being the whole point of the Restoration. This isn't just about renaming a city: it's the Emperor announcing that he is serious about getting back into governance, and preparing to move his base of operations as the first step in that direction. Also note use of chin 朕, the [+emperor] first-person pronoun. There's additional text below the edict itself, but it's mostly about how great and prosperous a town Edo/Tokyo has always been, plus reassurances that Tokyo and by extension Japan's post-restoration future is so bright that everyone in it should be wearing shades. Unfortunately, shades had not yet been invented, so those who could afford it settled for imported bowler hats and umbrellas. True story.